On 27 February 2017 Rose brought a lawsuit against U2 alleging copyright infringement of his song Nae Slappin by their 1991 hit The Fly, and claiming damages of "at least $5m. The document is available to download and read here. On 9 May 2017 attorneys acting for U2 filed a memorandum seeking to dismiss the complaint. On 20 June Rose's attorney filed an amended complaint, and on 18 July 2017 attorneys acting for U2 filed a further memorandum seeking a dismissal of the action. Rose's original lawsuit in February 2017 claimed that Nae Slappin' was "played and repeatedly listened to in the Island Records office, including by senior executives". U2 were signed to Island Records in 1980 and were, again according to the suit, "often in the Island Records offices". The suggestion is made that U2 were "seeking a stark departure from their previous music" . . . and "felt in need of reinvigoration". The Infringing Work features an elaborate and distinctive guitar solo nearly identical to the one in Plaintifls'Work. The guitar hook in the songs is the same. The percussion in "The Fly" accentuates the same points in the bass line as in Plaintiff s Work. The dimensions of sound of the songs are substantially similar or literal in specific fragments. The lawsuit concludes that after listening to both songs, "an ordinary lay observer would reasonably find that the songs are substantially similar and that an infringement has occurred. Indeed the similarities between Plaintiff s Work and the Infringing Work are so strikingly similar that independent creation is precluded." 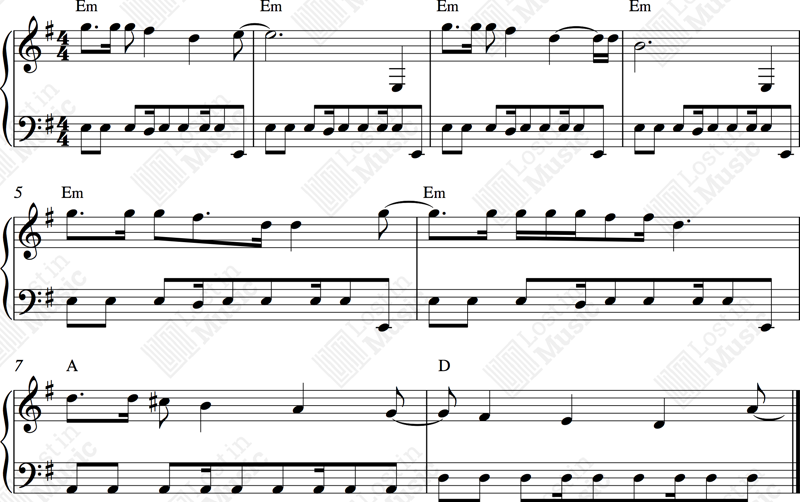 When pressed to give more specific examples, the amended suit from Rose, submitted in June 2017, referenced a "tambourine present in both tracks", the "drum and percussion, and the bass line, is the same at points in both songs", and "the first chord change", from "E7 to A7" is "reflected" in the bass and lead guitar in The Fly. In May 2017 U2 issued a motion to dismiss the complaint of Paul Rose, asking the court to throw out the allegations. They asked why he had taken over 25 years to file a complaint of infringement. They sum up the situation by saying, "put simply, the works at issue are entirely different and, as a result, sound nothing alike. This conclusion is inescapable upon simply listening to the two songs, one after the other, which the Court must do on this motion. That is the crux of the ordinary listener test, and because Plaintiff’s claims plainly fail that test, the Complaint should be dismissed." They go on to point out that the lawsuit from Rose makes no specific reference to how The Fly allegedly copies Nae Slappin', relying instead on vague references to the works sharing "musical ideas" and "dimensions of sound". Rose's references to similarities in tambourine, bass and percussion are, U2 claim, "unprotected ideas". The songs are fundamentally different - Nae Slappin' is "a series of multiple guitar solos with percussion . . . no vocals and no lyrics". The Fly is "a different animal", following "a traditional rock/pop song structure". Both songs are in the same root key of E. Both guitar solos start on the same high G natural note, and follow the same melodic shape for the first few notes, but then the resemblance stops. The notes that are common to both here - G, F#, D, E are close neighbours to each other and common to the scale of E minor. 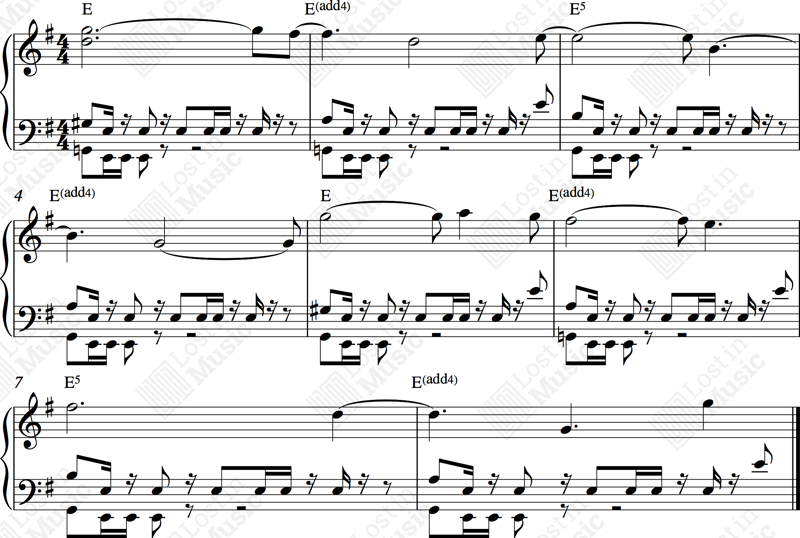 Note that it is impossible to transcribe in musical notation all the nuances of the guitar solos. (Rose) © Paul Rose. Recording by Paul Rose ℗ 1992, Paul Rose. (Hewson/Evans/Clayton/Mullen Jr) © Blue Mountain Music Ltd. Recording by U2 ℗ 1991, Island Records. The ruling was handed down by District Judge Denise Cote on 30 January 2018. The ruling noted that nowhere did Rose explain what elements of the thirteen second extract of Nae Slappin' were original and protectable. The judge found difficulty with Rose's comparison of the "style" and "skill" of performance in both songs, which she found to be unprotectable. The ruling goes on to state that, even if some elements of Nae Slappin' could be found to be protectable, they would still not constitute a sufficiently "substantial" portion of the work. The fragment in question in Nae Slappin' is not repeated, and is therefore not substantial. The ruling confirmed that the use of a tambourine is "not protectable", and in any case the tambourine is not used in the same way in both songs. The claims relating to drum, percussion and bass lines were deemed "too vague to describe protectable expression". Neither can the chord change of E7 to A7 afford copyright protection, being a "common musical occurence". The judge did not appreciate Rose's reference to similarities in "the dimension of sound", without any supporting guidance as to what was meant by this phrase, and concluded that the allegation does not amount to "a plausible claim of infringement." To state a claim for copyright infringement, a plaintiff must plausibly allege facts that demonstrate 1) that his work is protected by a valid copyright, 2) that the defendant copied his work, and 3) that the copying was wrongful. Copyright protection extends to “original works of authorship fixed in any tangible medium of expression,” such as musical works. The “sine qua non” of all copyright protection is originality. In copyright cases alleging infringement of a musical composition, a court considers only a song’s composition -- the notes, rhythm, and harmony, for example -- and does not consider elements of performance of the composition, like the skill with which the composition is played. Generally, individual notes and common rhythms are not protectable. To show wrongful copying, a plaintiff must show a “substantial similarity” between the infringing and infringed work. Were Julius Caesar alive today, and a musician, he might amend his eternal Ides of March question to ask just that. Bono, if you do not know, is the lead singer of the Irish rock band U2, and is a defendant in my latest litigation. He and his three band mates, The Edge, Adam Clayton and Larry Mullen, Jr., are accused of copying a song written and performed by my client, Paul Rose, and turning it into "The Fly," one of U2's biggest hits. U2 undoubtedly heard Mr. Rose's song, entitled "Nae Slappin"" (he is British by way of explanation) before releasing The Fly. U2 was recording in the studios of Island Records, their label at the time, when Mr. Rose submitted a demo tape of that song to Island executives. According to an acquaintance of Mr. Rose's, the tape was received and played in the Island offices, by several executives. This occurred at the same time that U2 was at Island Records, recording for their new album, "Achtung Baby." A few months after Mr. Rose's demo tape was received, "The Fly" was released as the first single from that album. Not only is the sequence of those events promising for the plaintiff, but there is also a witness to them. The best evidence, however, are the songs themselves when played side-by-side. They sound almost indistinguishable to my biased ears, and clips of the two have been played on the radio and circulated on the internet. Most media outlets seem to agree that the songs are similar, and the case is strong, with the notable exception of Saturday Night Live. SNL's "Weekend Update" ran a story about Mr. Rose's case, and expressed doubt about its merits, and specifically about Mr. Rose's lawyer. "Weekend Update" opined that I might not argue zealously for Mr. Rose, because I was really working..."Pro Bono." There are resonances here of the Malmstedt v EMI case, where a relatively unknown musician, spotting a similarity between a song he has written and an international hit single, and being able to demonstrate a possibility of access to his song by the writers of the hit, brings an action. It is hard to understand the dogged determination that drives Rose and Malmstedt to pursue a risky action, other than the absolute conviction that their work has been plagiarised and someone else has benefited considerably from their invention. Yet in both cases the rulings demonstrated that the areas of coincidence between the two were common in music and were therefore not protectable. Irish Times article 4 March 2017 by Kevin Courtney: Suing U2 - who really created that Achtung Baby guitar solo?